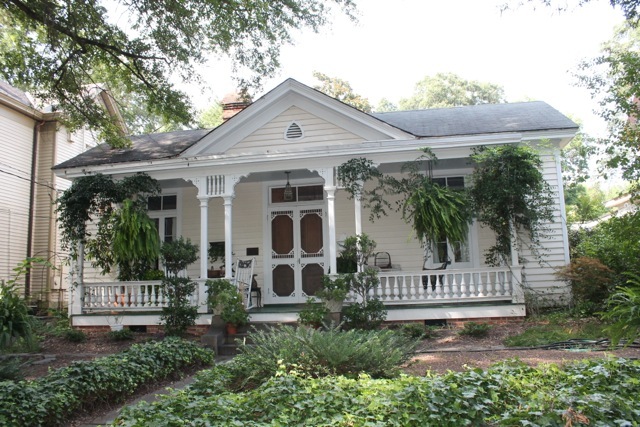 Arguments over the style of a North Carolina architect's home - the focus of a recent media firestorm - are being heard today by a judge in Wake County Superior Court. 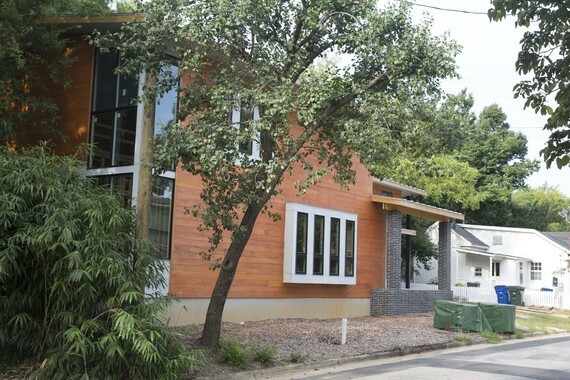 Unless you were swathed in media-proof bunting for the past few months, you couldn't have missed this saga unfolding over modern versus traditional in Raleigh's historic Oakwood neighborhood. Al Roker clucked over it on NBC's Today show. The Seattle Times duly picked it up for the benefit of West Coast modernists. And architecture critic Paul Goldberger swooped down like a deity from New York, to see for himself and issue judgement for the readers of Vanity Fair. The publicity's had its effect on both sides of Euclid Street in Raleigh. "A neighbor has taken a brutal beating," says Mary Iverson of the Oak City Preservation Alliance (OCPA). "She's been obliterated by the press." "She has been painted with a very black brush, when all she's been doing is standing up for her rights," says OCPA member Don Becom. 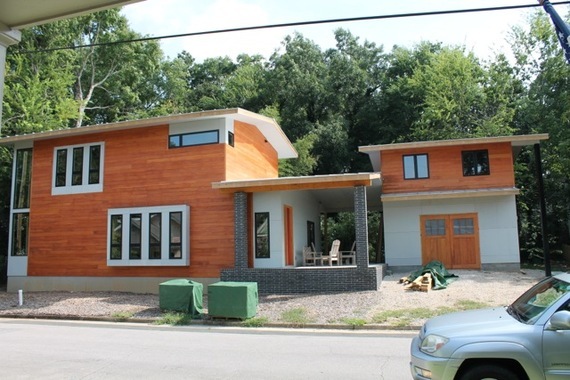 They're referring to Oakwood resident Gail Wiesner, who in fall 2013 appealed a certificate of appropriateness granted architect Louis Cherry for the new Craftsman-inspired residence he designed for a tight little lot across from her home. Certainly she was within her legal rights to do so. And armed with an effective attorney, she won. Cherry stopped construction on the home in April, though he did win an injunction to continue work that would protect the property, as his appeal worked its way through the legal system. 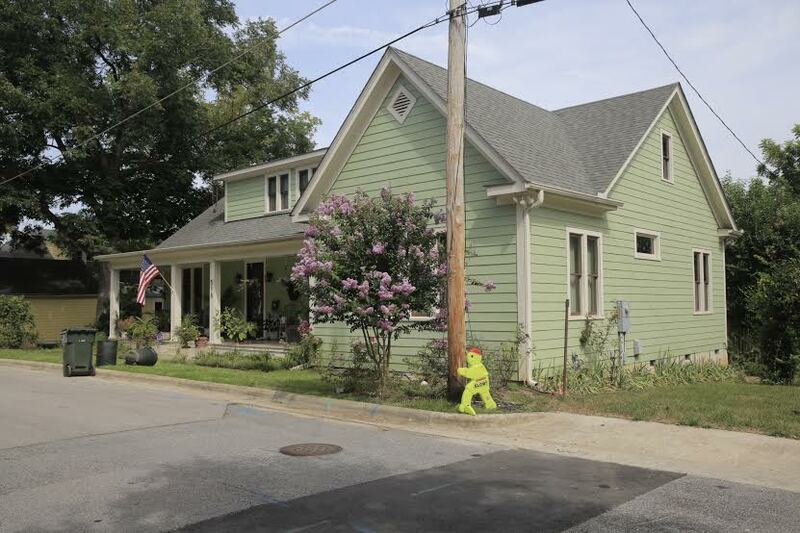 Citing the Cherry home as a catalyst, OCPA was formed six months ago to preserve the historic character of the neighborhood known as Historic Oakwood, with its structures built between 1880 and 1939. The area is protected by guidelines written and revised over the years by city staff, based on state statutes. It's those guidelines that members of OCPA believe have been violated by Cherry. "We see the Euclid Street house as a threat," says Iverson. "Our concern is that builders will come in with carte blanche to build anything here. The guidelines would lose their consistent interpretation of the last 40 years. We are shocked at the way they've been interpreted." "If we start to allow outliers to come in, we could lose our historic designation," adds OCPA member Heather Scott. Cherry's home, the group alleges, violates guidelines for the historic district, including a style they say is modern rather than conforming; a scale that's disproportionate to the single story homes surrounding it; and materials that are counter to what's prevalent in the neighborhood. "It's beautiful and his work is gorgeous, but the problem is it violates the state law and the enabling guidelines for historic designation," says Scott. Cherry, the group suggests, continued to build his home at his own risk, once Wiesner's appeal was filed in November. "She had the right to appeal," says Scott. "And he had the right to appeal too, but I wish he'd take personal responsibility, and not blame the neighbors." There are, of course, two sides to this story - which seems to turn on the definition of one word: compatible. It's sprinkled liberally throughout the neighborhood's 40-year-old guidelines. But everyone, it seems, defines the word differently. 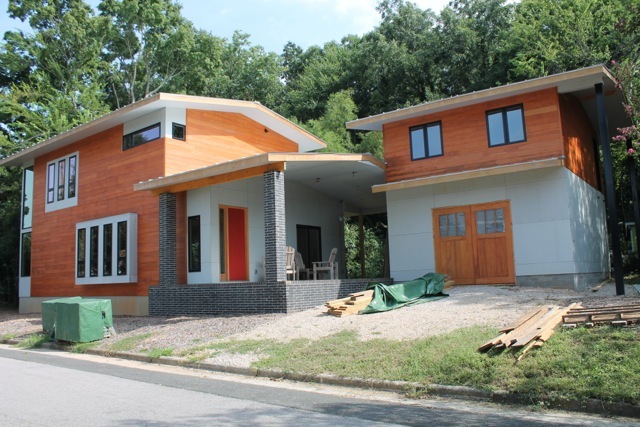 "People can have opinions about whether a contemporary home can be built," says Cherry. "But in the guidelines, Section 4.3 says: design new buildings to be compatible to the surrounding buildings in height, form, size, scale, massing, proportion, and roof shape." Which the award-winning architect - recipient of a number of coveted Honor Awards from AIA North Carolina as well as the Henry Kamphoefner Prize from N.C. State - carefully followed as he designed his home, checking in with city officials faithfully along the way. An initial look to the left and right of Cherry's home might raise an eyebrow or two about compatibility, but a serious look directly across the street reveals a home that's built on a tiny lot just like his, that's two stories tall just like his, and that's 329 square feet larger than his modest 2,100. It belongs to Wiesner, who built her home in a much more traditional style in 2008. Compatibility of styles seems to be her issue; apparently, she's not enamored of modernism. "If you speak with Myrick Howard [president of the non-profit Preservation North Carolina] - who helped write the guidelines - about how to interpret them, you'll find them silent on style, and intentionally so," says Cherry. "Section 4.3.11 defines the overall size and shape of the design so that it's compatible with but discernible from existing structures." The idea behind the guidelines is not to discourage any particular style, but to encourage a streetscape that enjoys the same spatial relationships, house-to-house and street-to-street - and one that ties the neighborhood together and allows diversity in style, including older and newer buildings. It's also about evolution in architecture - and Cherry's Craftsman-inspired home, one that carefully picked up the early 20th-century vernacular of the neighborhood - is a walking, talking example of that. Compatibility by nature implies different. It doesn't mean to make something identical to something else, or to mimic. It means working within context. Or, as Webster's says: capable of existing together in harmony. With the conflict over Cherry's house, that seems unlikely in Oakwood anytime soon. Harmony was thrown under the bus months ago. "It's hurt the Oakwood brand of hospitality - there are people who don't talk to each other anymore," Cherry says. "There's a perception that there are people who will cause harm to their neighbors because they don't agree with their tastes." A judgement is due within weeks, though no one expects an easy end to the controversy. "We fully expect an appeal, no matter what the outcome," says Iverson. And, one surmises, plenty of publicity - and very little harmony.